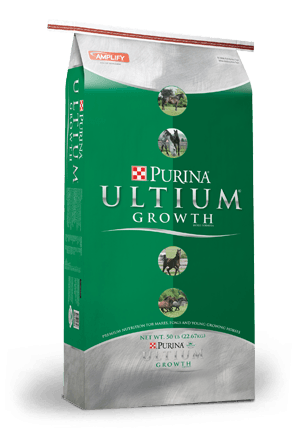 Purina® Ultium® Growth Horse Formula was conceptualized after the Purina new product development team completed their successful launch of the original Ultium® Competition Horse Formula. The Ph.D. nutritionists at the Purina Equine Research Unit in Gray Summit, Missouri knew the advantages of feeding meticulously formulated, higher fat and fiber feeds to competitive athletes. But could the same principles be applied for young growing horses? Since then, research spanning over four years was performed to develop a new feed formulated specifically for young growing athletes. Purina performed detailed scientific feeding trials on broodmares and young horses from multiple foal crops at varying ages, breeds and management situations. The research involved monitoring and measuring growth curves, body condition, joint health, activity levels, blood work and more to ensure optimal nutrient delivery to broodmares and growing horses. The result was unique, industry-leading nutrition proven to support the development, growth and adaptive physiology necessary to produce a strong, healthy athletic horse.